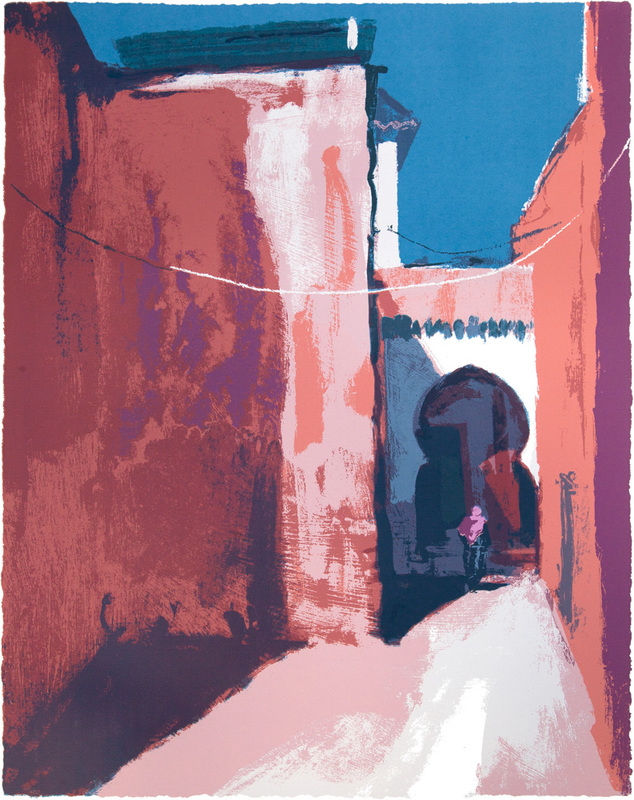 This started off as a painting done, late afternoon, in the backstreets of Marrakech alongside one of my oldest friends and fabulous drawer/printmaker, Mick Armson. The light changed quickly, intensifying the colours and rapidly lengthening and pivoting the shadows from the surrounding buildings around the narrow alley. The alleyway was quiet with the occasional woman in a colourful djellaba (traditional long-hooded, baggy robes with sleeves worn by women and young girls almost ubiquitously) appearing or disappearing through the arched opening. Inexplicably, within 10 minutes of picking the spot, as moths to a flame, we were surrounded by lots of kids intrigued by what we were doing. The print that I have derived from my painting is a twelve colour silkscreen printed in a combination of opaque and transparent inks to help convey the translucency of the light.